Warner Bros. has been making big waves with DC Comics superheroes on TV between Arrow, Gotham and The Flash. It was a bit surprising that there was only one DC hero in the studio's big announcement of the first slate of projects for its new digital-exclusive division, Blue Ribbon Content. 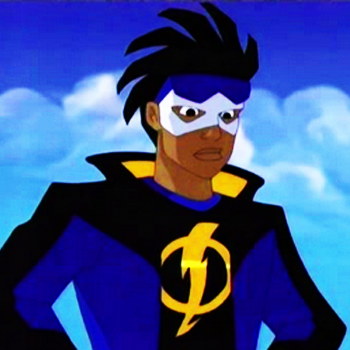 But the lone hero they chose will likely make lots of fans very happy: Static Shock is back! Originally created in 1993 by the late Dwayne McDuffie for Milestone Comics, Static Shock was a groundbreaking independent-imprint of DC that focused on a universe of predominantly minority superheroes from minority creators and has since been merged with the mainstream DC Universe continuity. The character became the best known of the Milestone line after being adapted into a well-regarded animated series that was integrated into the DC Animated Universe. The character is an African-American teenager who acquires electromagnetic super-powers from an accident and adopts a superhero identity to battle supercriminals in his city. The new version will be overseen by Reginald Hudlin and Milestone/original-series veteran Denys Cowan. No release date or timetable has yet been set.